It’s that time of year again – The leaves are changing, the weather is getting cooler, and students are headed back to school. Yup, it’s fall, one of our favorite seasons here at Saha Global because it means that it is time for us to hit the road and spread the word about our Global Leadership Program! Over the next couple of months, the Saha Team is going to be speaking all over the US. Check out our schedule below and come on down to an info session near you to learn about how you can join us in Ghana this winter as a Saha Field Rep. Make sure to check back – we are constantly updating this list by adding new schools and presentations. Don’t see your school on this list? Contact kathryn@sahaglobal.org or join us for a virtual info session. Ti dema – You’re invited! Come out and learn about working in Ghana this June. Fellows give us lots of feedback (thank you fellows! We love you guys!) One standout response we get pretty much across the board is that everyone LOVES the transportation situation. 6 person taxi rides? An intimate bonding experience! Push-starting Shak’s Jeep? Awesome bicep work-out! Ok, so it isn’t everyone’s favorite aspect of the program, but it is an authentic look at the difficulties getting around where we need to get around. Where would we be without our motos? CWS staffer TJ poses for a picture. As you may have read, CWS is growing! That means that we are going a lot of different places at once. 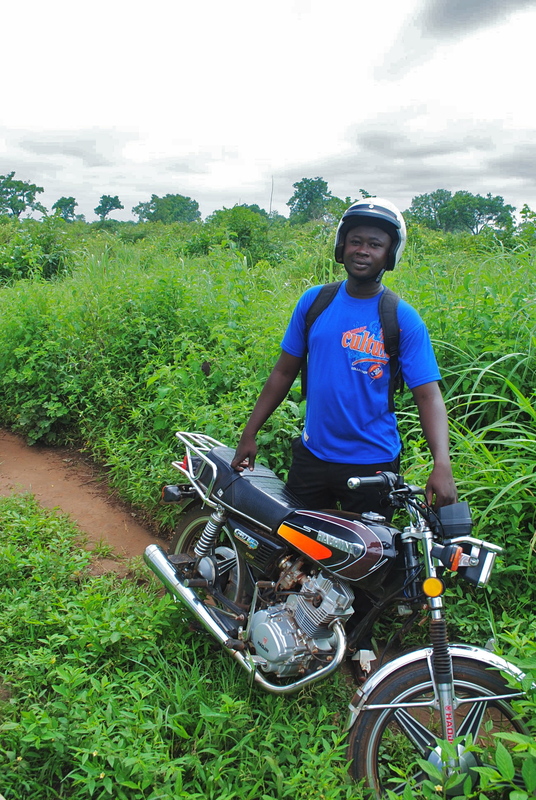 Of course, there’s the trusty CWS motos that help us monitor villages. But for longer distances our Rasta-flagged cycles just aren’t going to cut it. Which is where Metro Mass comes in! Posing with my favorite logo. that can get you to any big city your heart desires. They leave before dawn, they don’t believe in shocks and the get you places fast. My tickets average $3 USD for 6 hr journeys. America, take note! Affordable public transport is a beautiful thing. Ghana take note! So is air conditioning … maybe someday, Metro Mass, but for now a cracked window will do! If you are heading somewhere closer, somewhere smaller, or if you just don’t see yourself getting to the station at 5 am, tro-tros might be your vehicle of choice. These mini-buses are mostly older than I am and fit upwards of 25 people, plus roof riders! They leave when they are full, stop in every village on your way and (fingers crossed) mostly make it to your destination. Accidents are known to occur, so be wary, but they are a nice/the only option for roads without much traffic. And, if your moto happens to have broken down by the side of the road in some remote farmland, they will stop and find space for you. Scoot on over tro-mates and blast that hip-life! Last but not least, there’s the market truck. When our ladies come into the big city (Tamale, that is) to sell and shop, they mostly come in large groups in big mac trucks that can hold them, their friends and their wares. These ‘market trucks’ run only on market days (the chronology of which is still elusive). But they are also willing to pick up stranded pedestrians and are always good for conversation (or a nap). Beware during rainy season, however – rooves are not featured on these models! If this all seems a bit uncomfortable, well, it can be. But nowhere is Ghanaian hospitality more apparent than when passengers are willing to squeeze just one more in, or when you are “invited” to a refreshing orange by the man you are sharing a seat with. So, future fellows, count your blessings and don’t forget to give lifts in your private vehicles when you can – you’ll never know when you need that good travel karma! I’m sure that you all have been on the edge of your seats since Kathryn’s last post about CWS’ expansion! 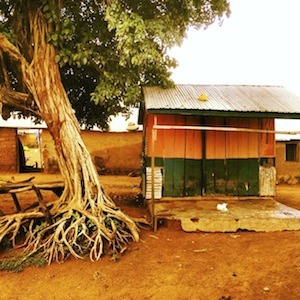 To recap: After a scouting trip to Liberia, Burkina Faso, and Togo last summer, Kathryn and I decided that for CWS’ first satellite office, there was really no place like home and began to focus our search on other Regions in Ghana. 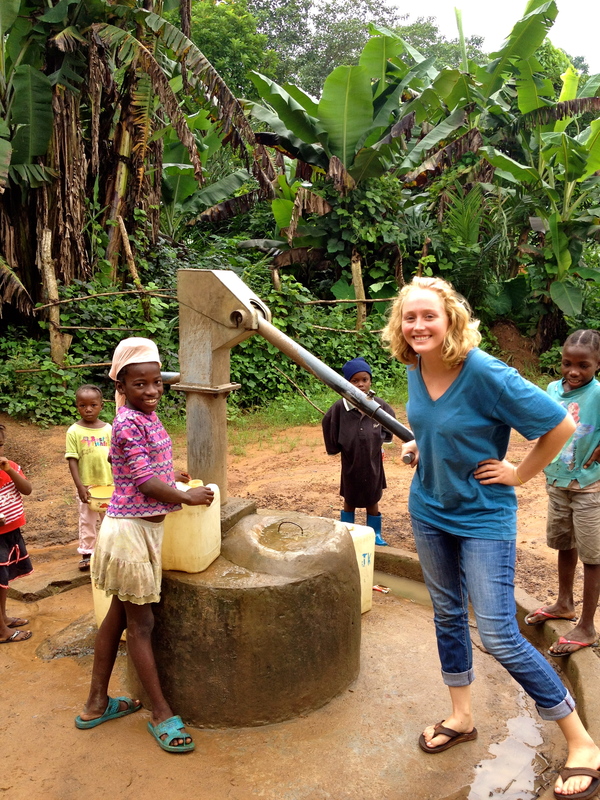 Kathryn spent the fall traveling around this beautiful country to learn about the water needs in the Upper East, Upper West, and Volta Regions as well as exploring more remote areas of the Northern Region. After months of moto, tro, and market bus rides to both big cities and rural villages throughout Ghana, we decided that the small city of Salaga, a seemed like the best fit for our next base of operations! 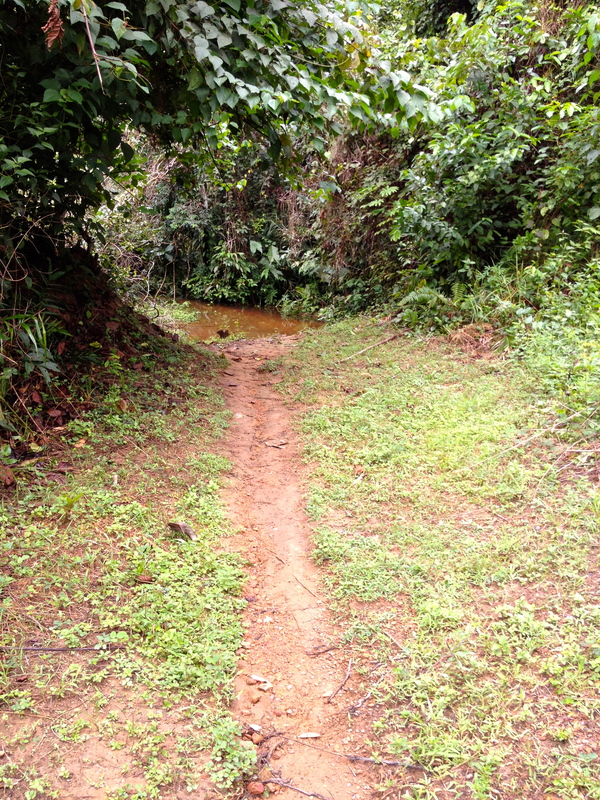 The river in Tunga – the village’s only source of drinking water. Once we had selected Salaga as our potential new base of operations, the next step was to pilot a CWS water business in a nearby village! While we were fairly confident that both our water treatment technique and our business model would work well in this area, this pilot was essential in figuring out our supply chain and transportation logistics. 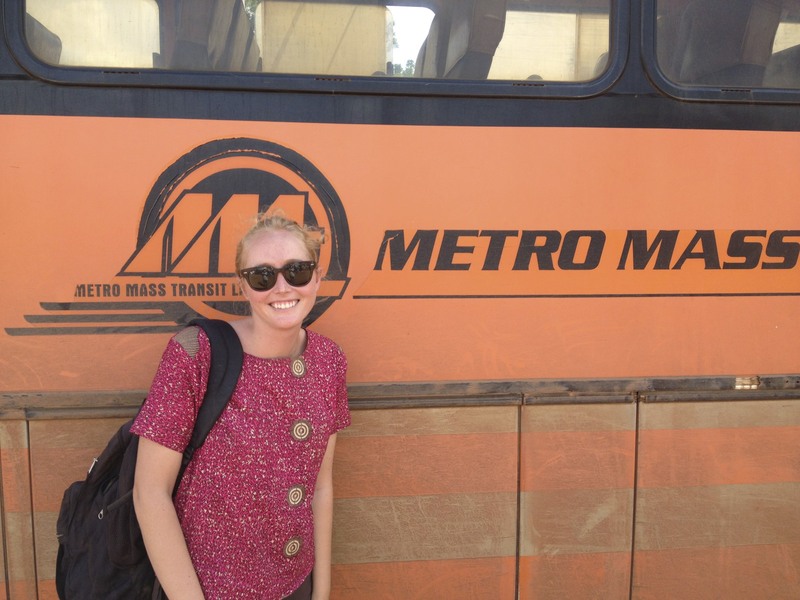 As many of our past Fellows know, transportation is a huge challenge here in Ghana! With the very poor road conditions around Salaga, we knew that finding a reliable way to reach the rural villages would be difficult. As far as supplies go, Salaga is much, much smaller than Tamale with a very limited market. So, about 90% of our supplies will have to be shipped down from Tamale – a process that we knew little about. A few more trips around Salaga later, we picked the village of Tunga for our pilot. Tunga, is a rural village of about 500 people located 40 minutes north of Salaga and right outside the larger town of Banjai. The only source of water in Tunga is a river, that is highly turbid and fecally contaminated. We met with the village chief and elders in early December and, after a great conversation, they agreed to work with us! Our awesome building team after the first day of implementation: Kathryn, M’Azara, Peter, Mahamadu, Haruna, DJ Alhassan and me. Both Kathryn and I had a blast working in Tunga over these past few weeks. 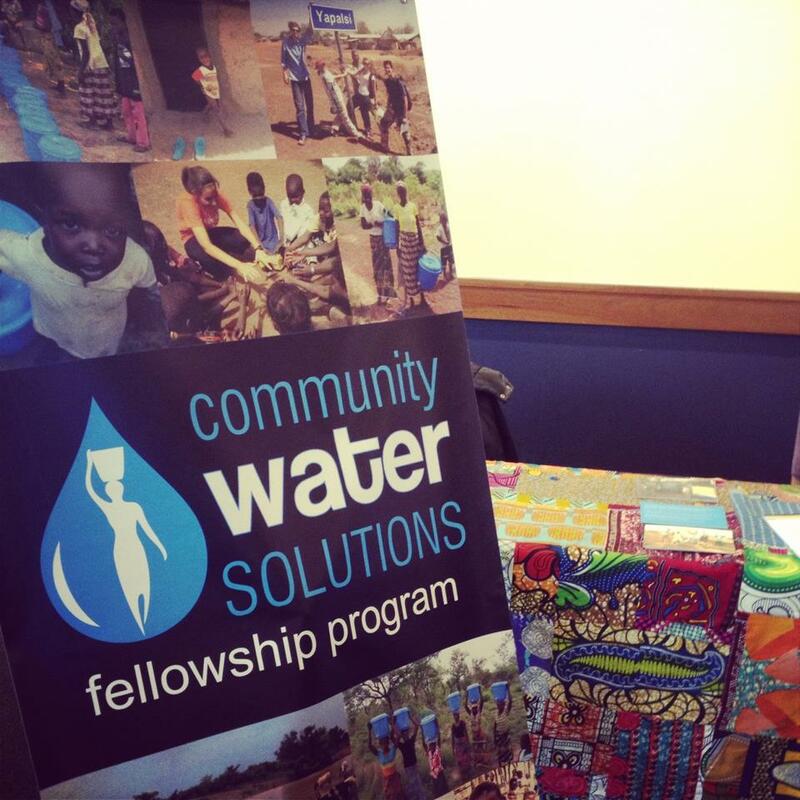 I have not implemented a water business since we launched the Fellowship Program in June 2010 and Kathryn’s last implementation was when she was a Fellow almost 2 years ago! After some initial delays due to the election and some car trouble (typical! ), the implementation process went very smoothly! The people in Tunga were extremely welcoming and a joy to work with – A group of local guys were very helpful in building the polytank stand and provided endless entertainment as we worked in the hot sun; An enthusiastic team of kids helped carry our safe storage containers all over the village as we distributed them to each family; And the women entrepreneurs, Sana and Aya, are a force to be reckoned with! We celebrated opening day on Sunday, December 16th and were very impressed with the turnout! Sana and Aya were completely in charge, leaving Kathryn and I with little to do besides take pictures! Sana selling water like a pro! So far, the pilot in Tunga has been a success! Stay tuned for more updates on CWS’ expansion plans! The search continues for a NEW base of operations! 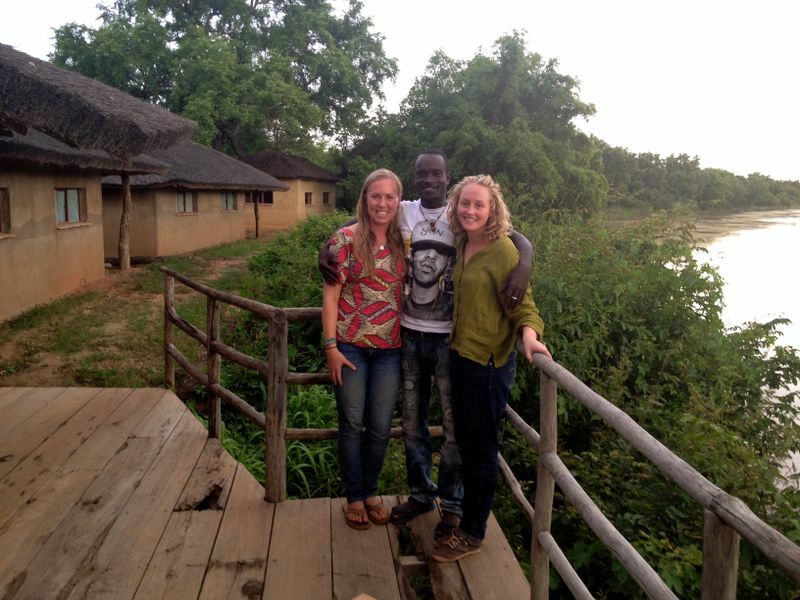 You can read about Kathryn and Kate’s impressions of our trips abroad to Liberia, Burkina and Togo on this blog. But all this travel reminded us that there’s no place like home. Could other regions of Ghana benefit from the CWS social enterprise idea? We intend to find out! Spotted: a fresh baby goat in Bolga! Upper East region was our first destination. This area of Ghana is known for its beautiful straw handicrafts, its crocodile ponds, and its wonderfully-named capital, Bolgatanga. 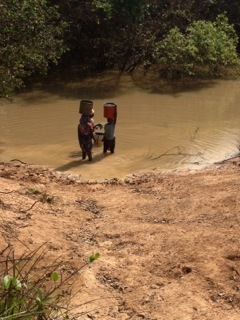 While boreholes are around, some smaller, remote communities still rely on streams or open wells for water. Could Upper East be a new CWS destination? Upper West was our next stop. 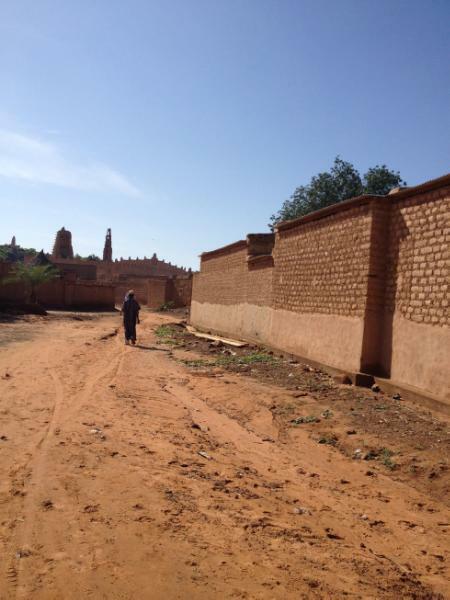 We found beautiful mosques, hippos and some village gold mining! Communities lacking boreholes have been more elusive, but our District Assembly contacts are on the hunt for potential partners. Could Wa, the Upper West Capital, be a new base of CWS operations? 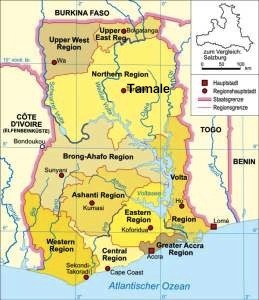 Volta Region is Ghana’s eastern portion and takes its name from the giant lake it borders. Roads might have been rough, but the fufu was delicious and the view of the mountains, incredible. Lakeside communities in particular seemed to lack access to potable water. Can CWS adapt what we do in Ghana’s smallest bodies of water to Ghana’s largest? Then there’s our own backyard. Northern Region is HUGE – one office could never serve all those communities here that could benefit from the CWS idea. After so many years, will our Dagomba pride really let us explore anywhere else while potable water needs exist all around us? Maybe Walewale or Salaga should be our next stop! Before we make any decisions there is work to be done. Stay tuned for new office updates here! 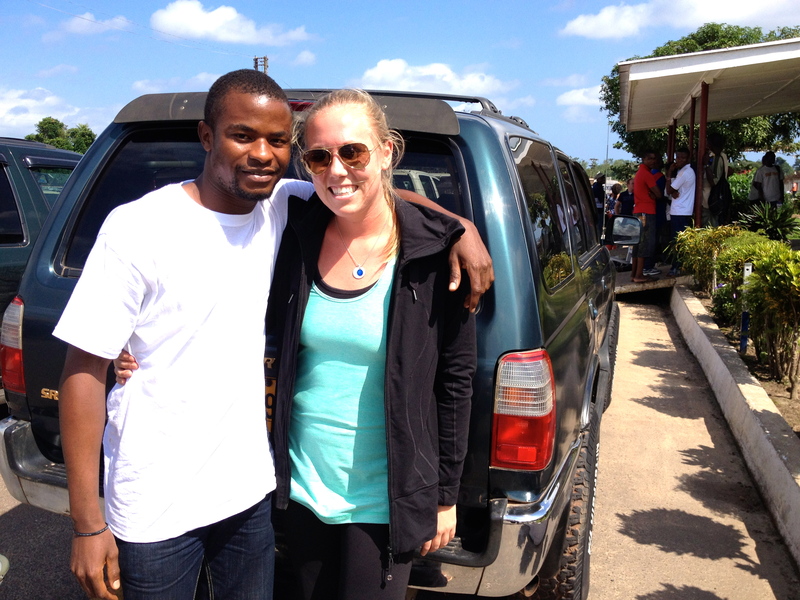 This July, Kate and I are traveling around West Africa to scout some new regions for potential CWS expansion. We are traveling to Liberia, Burkina Faso and Togo and will be documenting our trip in a series of blog posts called “CWS on the Road.” The funding for CWS’ expansion trips came this spring from an anonymous donor – THANK YOU for supporting CWS and allowing us to explore the possibility of working in new regions! After a couple hours back in Tamale – just enough time to enjoy some good food and friends, re-supply our travel bags with clean clothes, and catch some sleep in our own beds – we hit the road once more, with Project Manager Peter Biyam in tow. This time our destination was Burkina Faso, a francophone, landlocked country directly north of Ghana. Several hours of driving and one complicated border crossing later, we found ourselves lost in “the coolest name[d] … capital city in the world” (thanks, Lonely Planet): Ouagadougou. Wonderful Ouaga! Here we would score 1. the most detailed and handy map ever to grace my lap 2. a salad-and-rice-and-tomato sauce obsession that single-handedly fuel the Burkina and Togo exploits of our Ghanian travel buddies (something about the beans-n-rice/chicken-n-rice/food-in-general Burkinabé style did not sit right with the Tamale travelers – culture shock is not a solely Salaminga experience!). 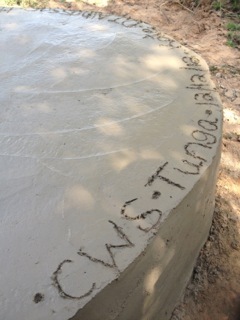 CWS staff do Burkina Faso! Over the course of a week, we managed to explore the south-west, north-east and south-east of this beautiful country. With our linguistic powers combined (high school French, small small Moré and Hausa), we were able to talk to college grads, cattle herders, chiefs and children that we met along the highway/road/trail/footpath about their water situations. 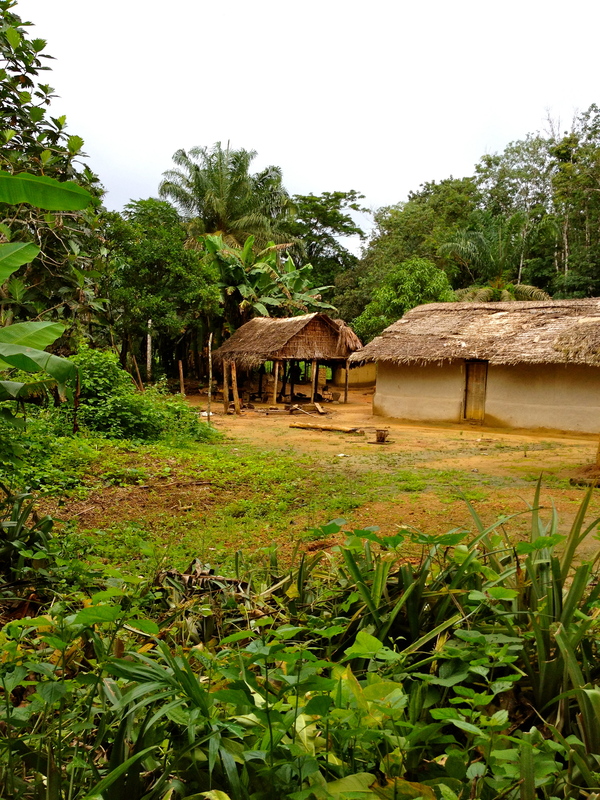 Our strategy was simple: drive to the most remote communities in the least-developed regions, ask lots of questions (“Que’ce-qu’il y a un pumpe dans cette village? Une barrage? Ou allez-vous pour l’eau d’boire?”), and see for ourselves what and how people lived and drank. Along the way we learned lots of new words (puits = well, marigold = stream, fou = crazy, bizarre = you get the picture…) met lots of incredibly friendly, patient and hospitable people, drove down many back-bush roads and only headed for home when the sun set, the rain chased us back, or flooding turned our road to river. 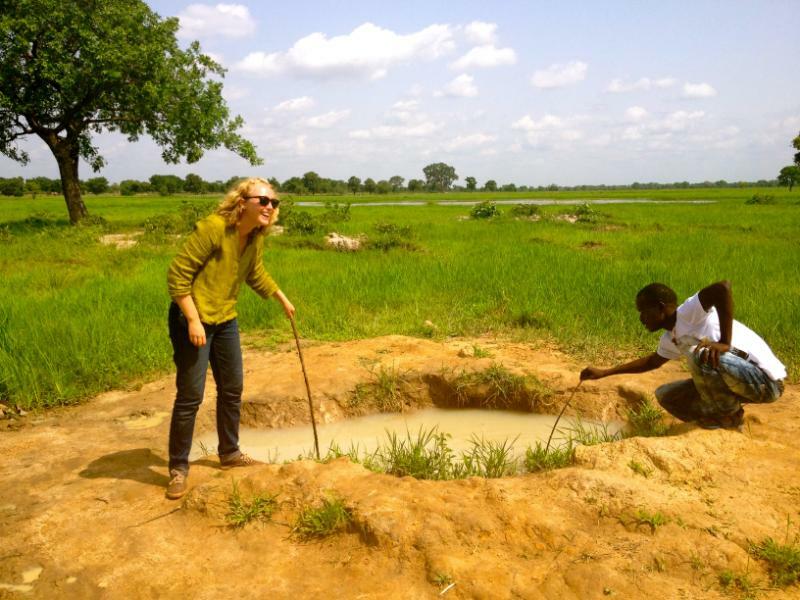 Using rigorous scientific techniques, Kathryn and Peter asses water depth in a hand-dug well. This source was only used for laundry. 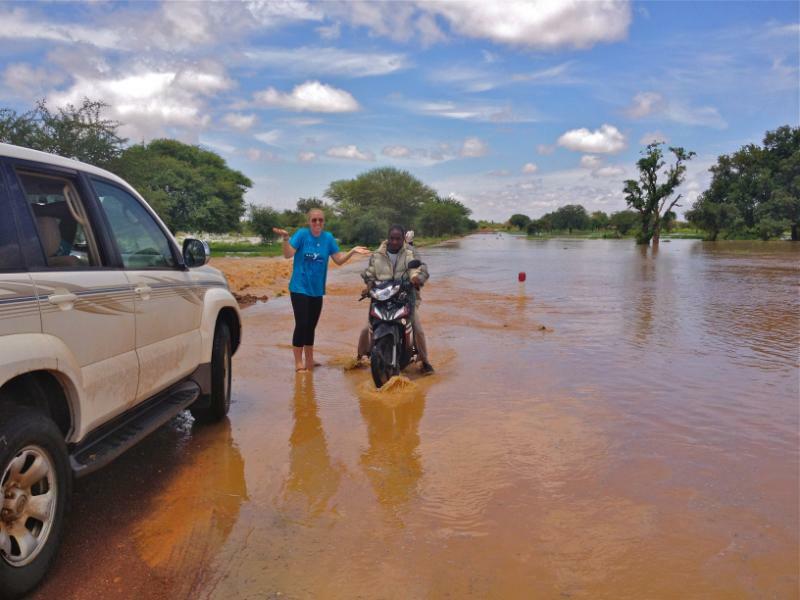 While our 4×4 could handle a lot, this flooded “road” was too ambitious even for us. What we found really surprised me. Burkina Faso is one of the poorest countries in the world; its GDP per capita is half that of Ghana’s. These sorts of economic indicators led me to expect potholed roads, few working pumps and lots of unimproved drinking sources. 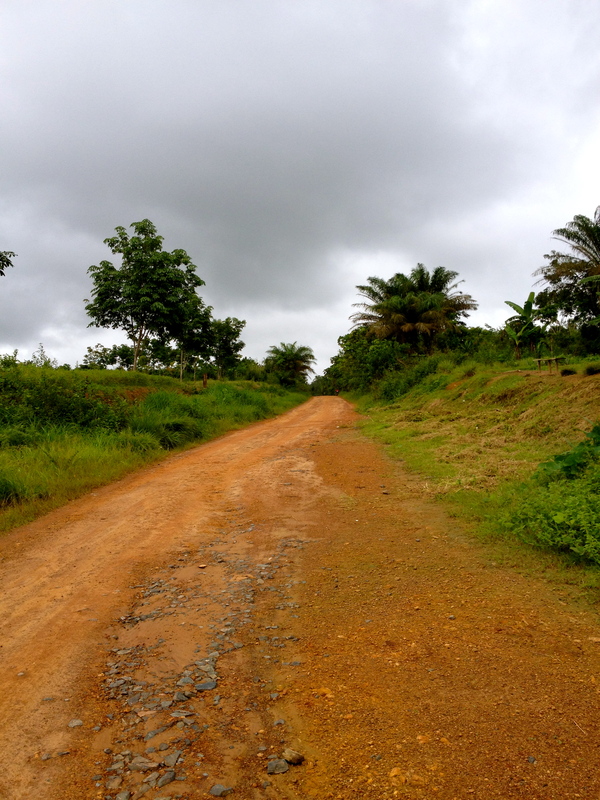 What we found were higher rates of french-speakers in remote villages than english-speakers in Northern Region (an indicator of educational opportunities and integration into the national economy) and well-maintained roads to put the Tamale – Kumasi highway to SHAME. Most importantly for our work, there seemed to be a consistent and pervasive network of functioning hand-pumps in place. Unlike in Liberia, our anecdotal experience suggested that there was an effective public/private supply chain in place to fix broken pumps – we found much fewer broken pumps, and where we did come across them, people seemed more confident about their repair. The two or three villages that we came across who were drinking from unimproved sources were usually small (less-than-five houses) and new: certainly not to be dismissed, but maybe just waiting to be incorporated into what seems like a competent existing water network. 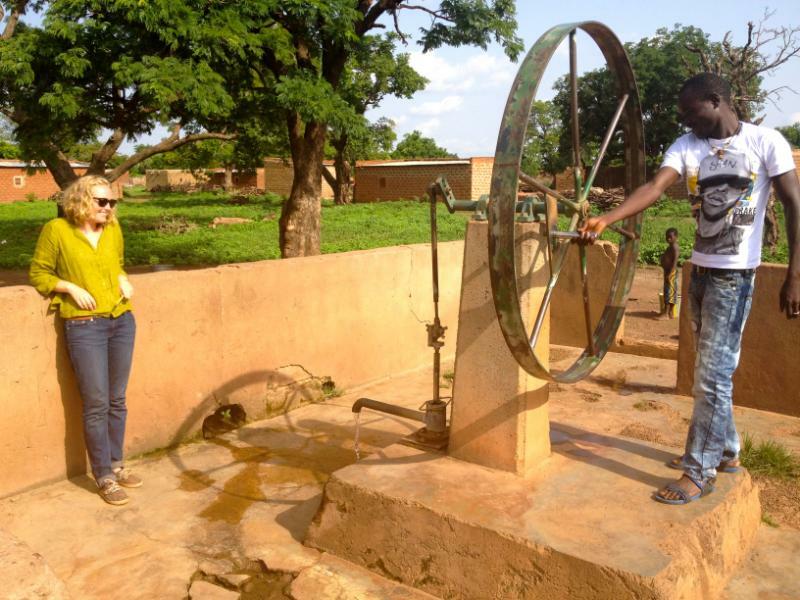 Peter checks out a working pump – this was the oldest model we saw, working since 1985! 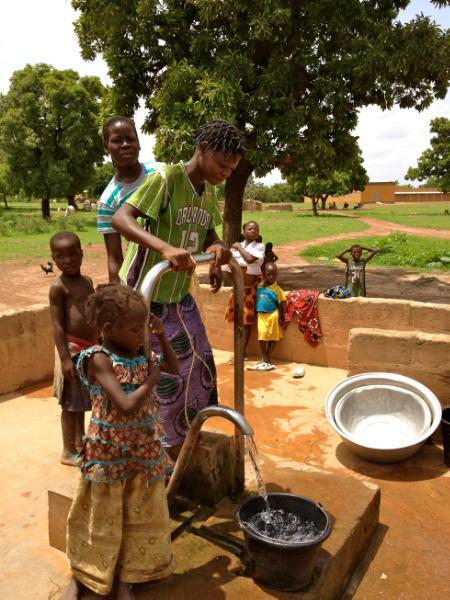 Just like in Northern Region, women and girls in Burkina are responsible for collecting their family’s water. 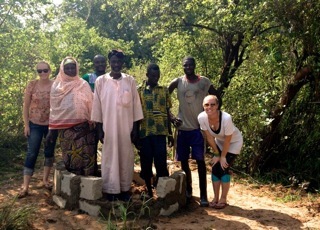 Here a few gather by one of the village’s several pumps to fetch drinking water for their family. Looks clean! 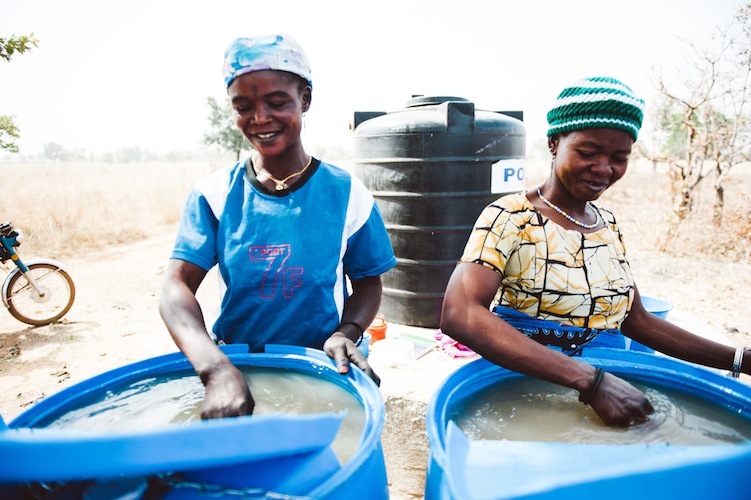 Though most villages have pumps, surface water are still important sources of water for life in rural communities. 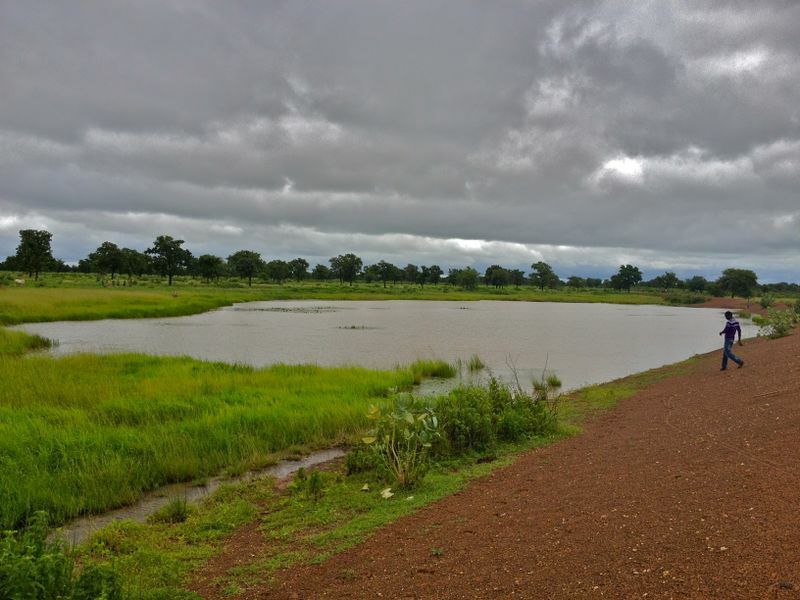 This lake will be a source of drinking water for the five houses in remote Ambara until it dries up in the spring. 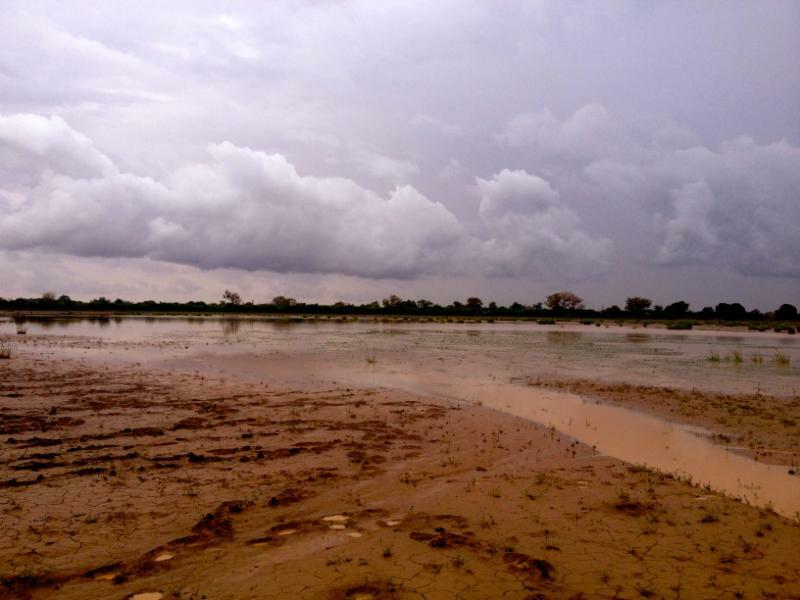 The water situation in Ambara is atypical for Burkina, but still deserves attention. 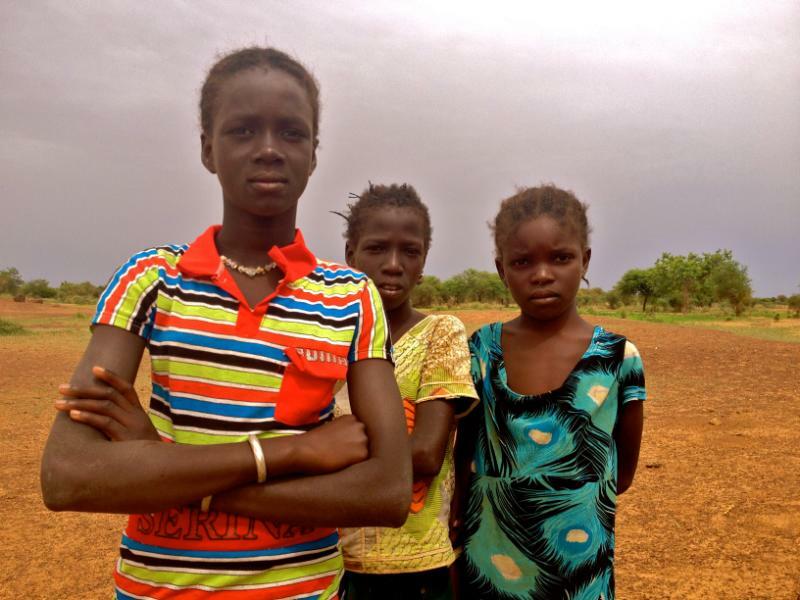 All this is not to say that Burkina Faso is an under-the-radar utopia. Burkinabés’ lives seem to be difficult in many of the ways that life is difficult in Ghana, and the water situation in particular is far from ideal here. The people that we met in our travels, however, had a lot to teach us about a different way of life just north of the border. Fulani women with silver in their hair, Mossi men riding cows to their fields, goats that look like gazelles, poulet yassa and ancient mud-relief mosques took us by surprise and made our trip to our northern neighbor constantly intriguing. For a place so geographically, hydrologically and socially similar to the northern region where we work, we were still forced to constantly reevaluate our assumptions. Though it may not be CWS’ most logical next move, Burkina’s capacity for surprise make me hesitant to draw any final conclusions from our week-long trip. Fulani girls check out the strangers at their stream. Au revoir, Burkina! Next up, Togo…. 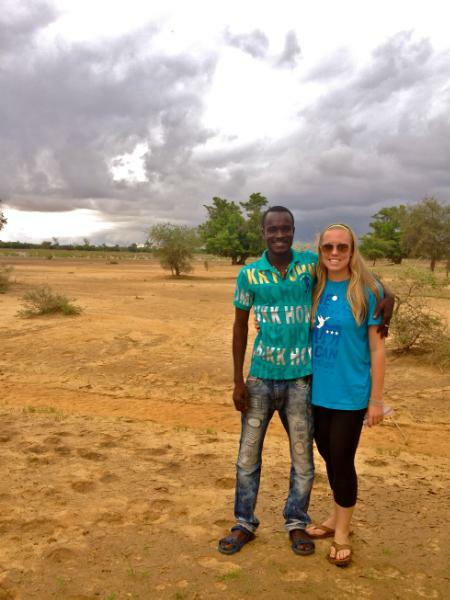 This July, Kathryn and I are traveling around West Africa to scout some new regions for potential CWS expansion. We are traveling to Liberia, Burkina Faso and Togo and will be documenting our trip in a series of blog posts called “CWS on the Road.” The funding for CWS’ expansion trips came this spring from an anonymous donor – THANK YOU for supporting CWS and allowing us to explore the possibility of working in new regions! 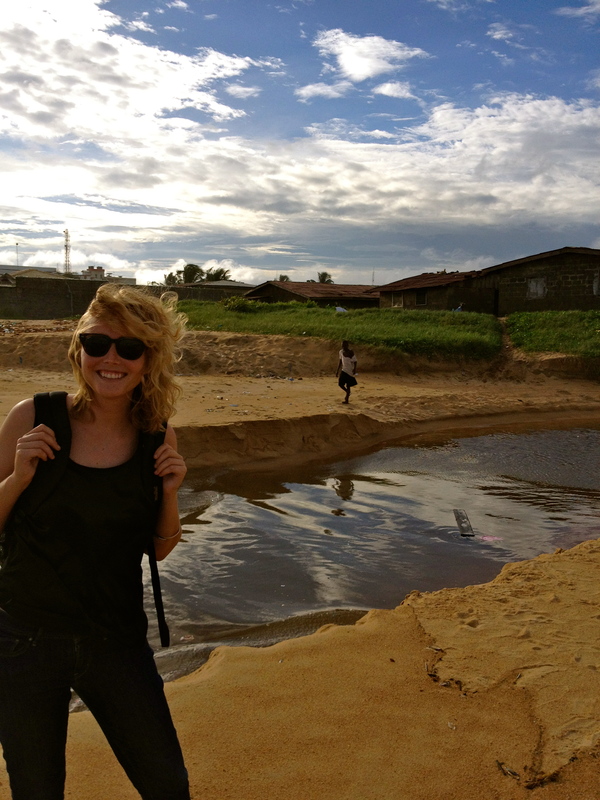 Last week, Kathryn and I packed our bags and headed to Liberia, W. Africa on a scouting trip for CWS. Armed with a guide book, some great WASH maps, and the phone numbers of recommended drivers, we arrived in Monrovia on the 4th of July, excited to be taking the first step towards expanding CWS’ impact to new areas. Kathryn on the beach in Monrovia right after we arrived in Liberia! We wanted to check-out the water situation in Liberia for a few different reasons: First, 14 years of civil war (1989-2003) destroyed most of the country’s infrastructure, leaving the majority of Liberians without access to water or electricity. Today,less than 10% of people in Monrovia (the nation’s capital) are on the grid. And that’s the capital of the country! Crazy! Second, Liberia is an english-speaking country. While the CWS team is used to navigating language-barriers, its always easier to get things done when you don’t have to rely on a translator for communicating! Finally, we had access to some awesome information! 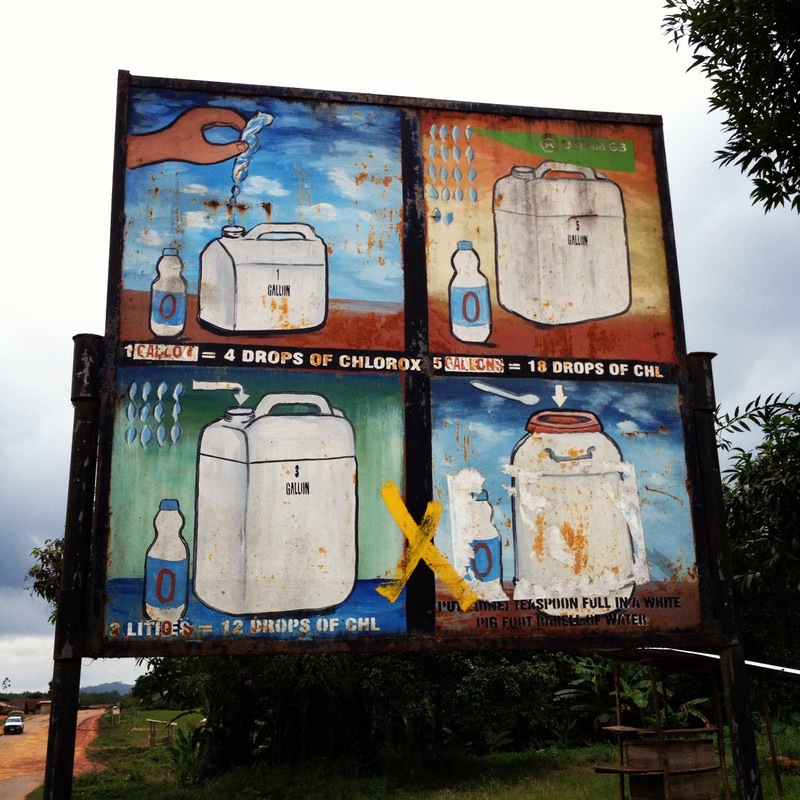 Last year, a bunch of WASH organizations working in Liberia got together and mapped all of the “water points” around the country. Most of these water points are boreholes with a handpump. The map noted if the pump was working or not and listed the implementing NGO. 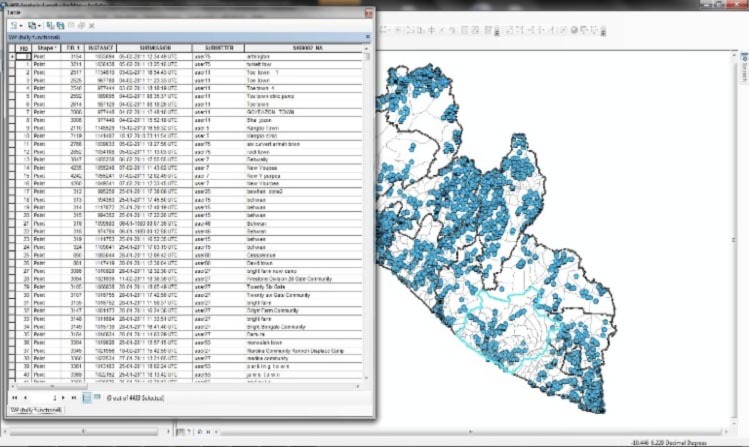 They combined this data with information on village populations and mapped out what they called the “corridor of need” based on water access (#of working water points/community populations). 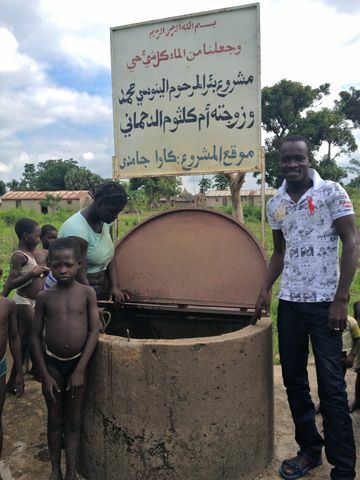 It is extremely rare to find such great information about water access in a country so we were thrilled! Although the WASH-Liberia Maps gave us a good idea about where working/broken handpumps where located, we were interested in learning what people were doing for their water once their handpump was broken. Did they drink from a surface water source? Rainwater? Something else? How easy it to fix a handpump? Are people fixing them? We also wanted to learn about community structure. How big are the villages? What is the village-leadership hierarchy like? What are the village markets like? Would people pay for drinking water if it was sold in their community? 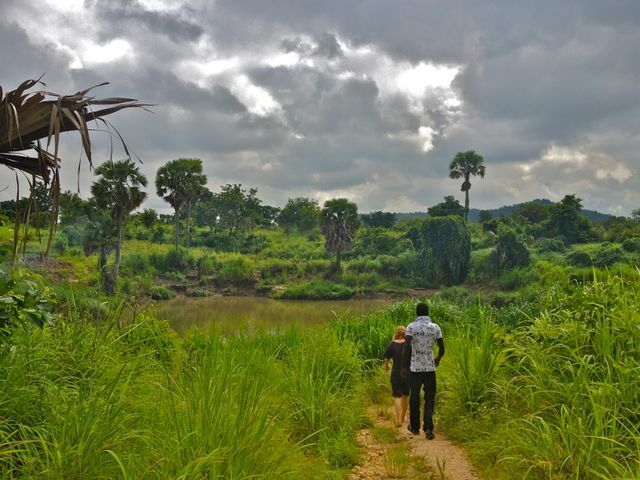 From our experience working in Ghana, we knew that the best way to learn the answers to all of these questions would be to get out in the field and talk to people. After spending a day in Monrovia, meeting with the Director of Liberia’s Peace Corp office (such an awesome guy who was extremely helpful!) and finding an great driver, we headed out to the rural counties to check out the water situation first-hand. First we traveled to Tubmanburg and spent two days driving around to villages in Bomi, Gbarpolu, and Grand Cape Mount Counties. We stopped-in as many communities as we could and talked to whoever was around and willing to chat! Our view for about 80% of the day: dirt roads and beautiful jungle! One thing that we were not prepared for was all.of.the.rain. 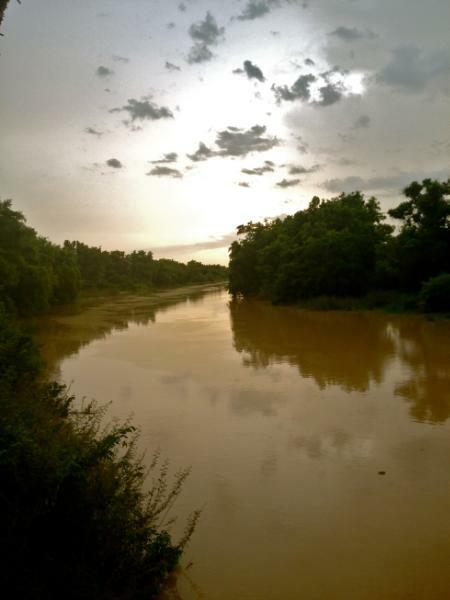 After over 4 years of working in Ghana, we knew that July = rainy season in West Africa. 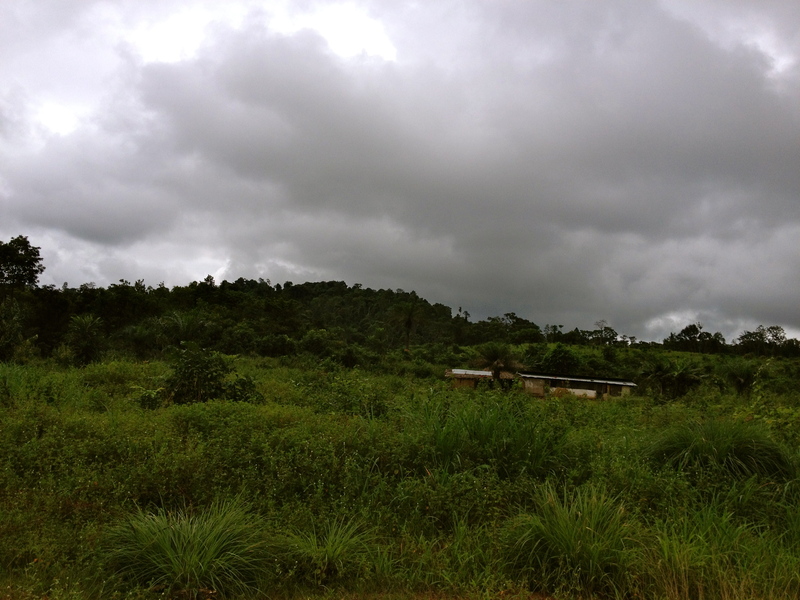 What we did not realize was just how different the weather and terrain would be in Liberia. In Ghana, the rainy season is similar to summertime in a state like Florida. Storms roll in quickly, it pours for a couple hours (most of time its less than an hour) and then the sun comes out again. Not in Liberia. It rained on and off all day, every day that we were there. To put it in perspective, the average yearly rainfall in Seattle is just over 36 inches. In Monrovia, its over 200 inches! The good news is, unlike Ghana where everyone takes a nap when it rains, Liberians are used to the constant rainfall and life goes on! 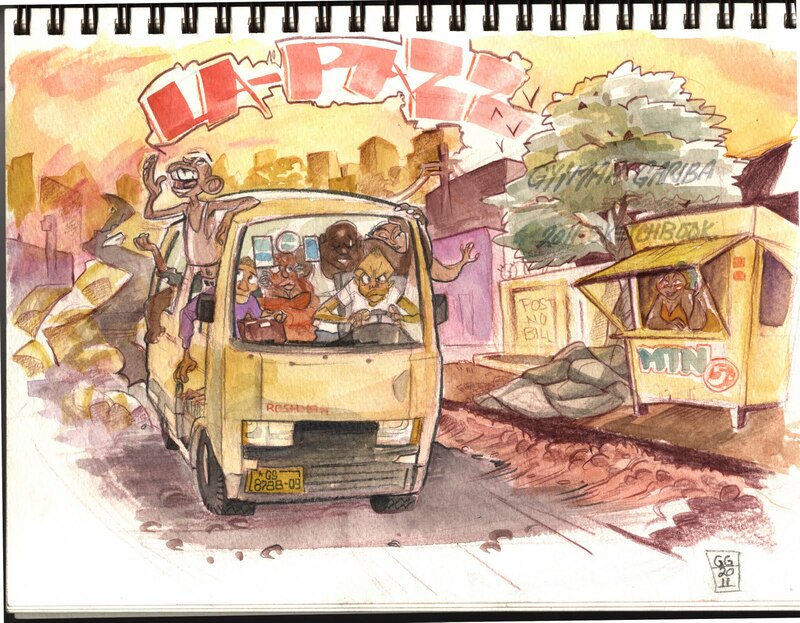 From Grand Cape Mount we headed back to Monrovia for a night and the journeyed up Gbanga. 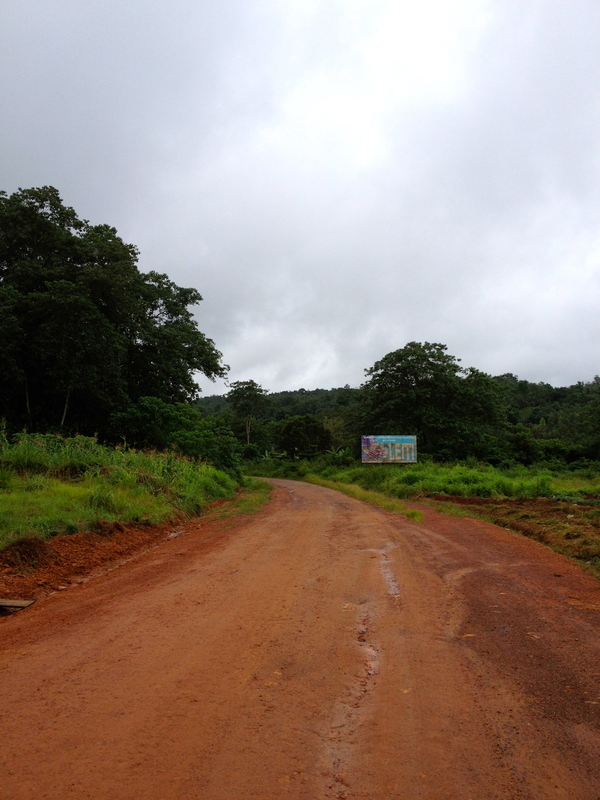 For the next couple of days we drove around Bong and Nimba County on the hunt for more handpumps, surface water sources and friendly Liberians to chat with. Overall it was a pretty awesome week in Liberia. Kathryn and I learned so much! Ultimately, we do not think that Liberia would be a good fit for CWS’ expansion. Mainly because there are just so many boreholes! 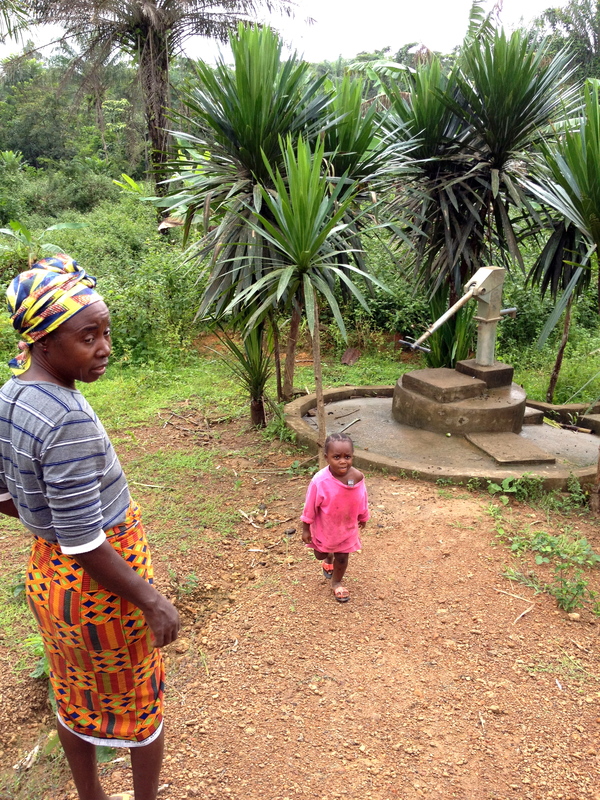 Right after the war ended, there was a huge push for borehole drilling in rural Liberia. Tons and tons of different NGOs came to build wells and handpumps. Coming from Northern Region Ghana, where you can’t drill boreholes, Kathryn and I were floored by how many boreholes there were. Drilling is also very expensive ($5,000-$10,000/borehole) so we could not believe how much money was invested in setting up these pumps. Almost every single village we visited had aleast 1 pump and many had 3-4. While we knew there were a lot of pumps from the WASH-Liberia map, the map only showed villages where NGOs had drilled broeholes. It did not tell us if there were more villages out there that hadn’t been reached.What we learned: there aren’t many, almost every community has atleast 1 borehole with a handpump! The problem? Pumps break. And they have broken…all over Liberia. If an average village had 3 handpumps that were set up by an NGO in 2005, that same village has only 1 functioning pump now (on average, based on what we saw in our 1 week). And often times that pump will run dry in the dry season. 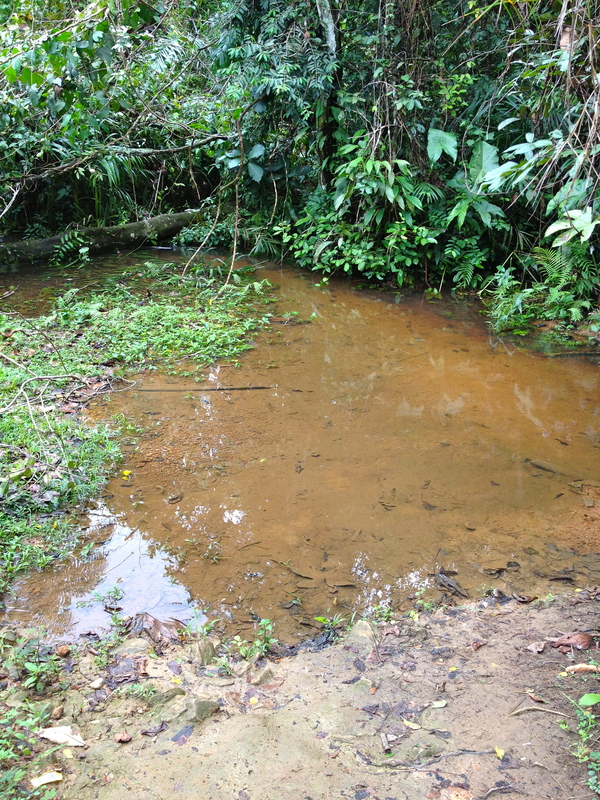 As a result, many people are still forced to drink water from surface water sources like creeks and streams. 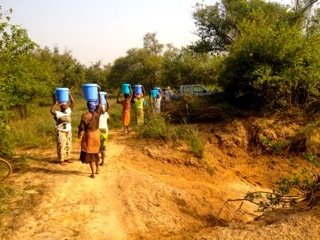 Although a lot of people were getting water from surface water sources in many communities, the presence of so many boreholes, working or not, would make it difficult for CWS to work in these villages. 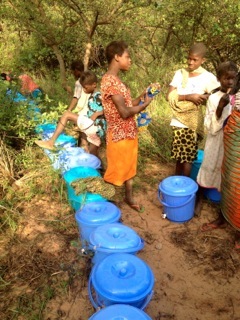 Even if a community only has 1 working pump, people would be much less likely to pay for water from a CWS business if there is a chance that they can get water for free from a borehole, even if they have to wait in a long line for it or even if there is a chance the borehole is dry that day. The thing that frustrated Kathryn and I the most was that out of ALL of the NGOs and aid organizations that came to drill these boreholes from 2003-2005, not one of them set up a system for dealing with pump maintenance. Almost everyone we talked to told us that when their pump broke they had no idea who to call to help them fix it, even if they were willing to pay for parts. We searched high and low for spare pump parts in both local markets and big cities, and they were no where to be found. There is virtually no supply-chain in the country for pump parts. In a handful of communities, we learned that there had been some follow-up, or that there was a person in town that they can call when they need help fixing their pump, but in the vast majority this was not the case. People are willing to pay to have them fixed! Is there someway you can get them parts? Maybe train local people how to fix pumps? 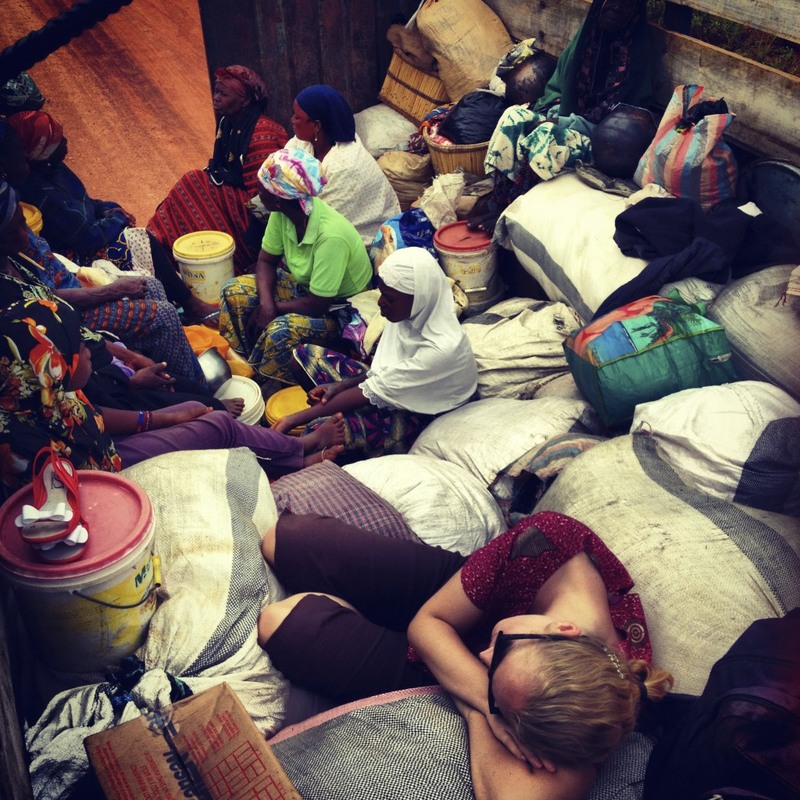 Not all of the water NGOs in the area share welt hunger hilife‘s “drop off and go” attitude. Population Services International is doing incredible work with household chlorination (also in HIV/AIDS, hygiene, sanitation and so much more!). They have launched an awesome social-marketing campaign to teach people how to chlorinate their drinking water and have helped to establish a sales-network for a locally manufactured WaterGuard (PSI-branded liquid chlorine). We met with their WASH program manager on or last day in Monrovia and she was awesome! 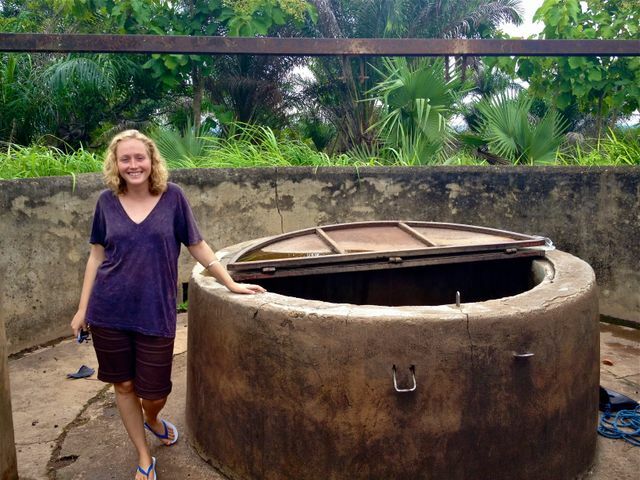 There is so much that we can learn from PSI’s work, both in Liberia and globally! Pumps aside, the community structure in most of these villages is very different from the set-up in Ghana, and would also make it difficult for the CWS system to work well. The communities that we visited were much smaller – like 10-20 one-family households vs. 30-100 multi-family (polygamous) households. 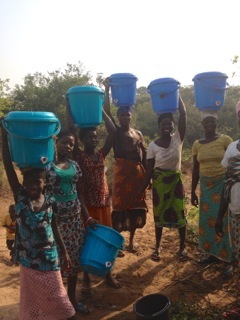 If we were to train 2 women to work at a CWS water business, there wouldn’t be very many families left in the town to buy water from them! There were also a lot of other small factors (market-structures, supply chains, availabilty of equipment, etc) that would make it hard for CWS to work in rural Liberia. Not impossible, just too difficult right now. We think that there are many big opportunities in the water sector in Liberia, just not good opportunities for CWS at this time. 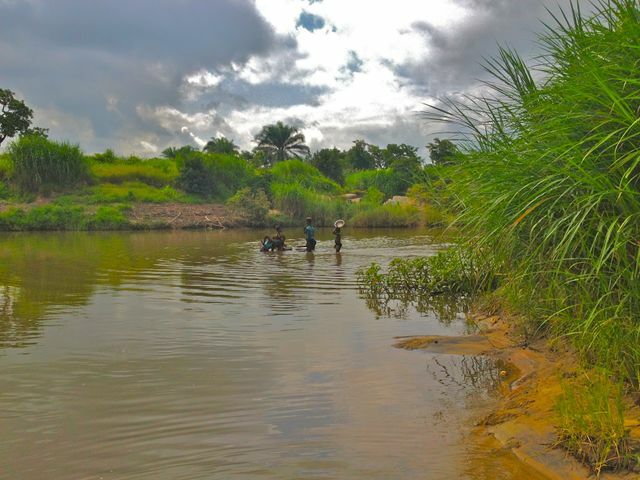 Household water treatment and rainwater collection would be great options for this area – if you’re reading this and your organization implements HWTS or RW catchment systems and want more info on opportunities in Liberia, let us know! 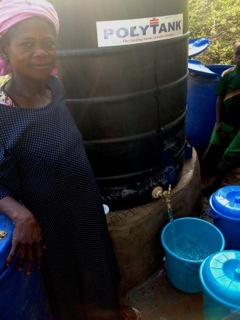 More importantly, if you worked in Liberia in 2003-2005 and set up handpumps in rural villages and then left, Come Back! Train people how to fix your pumps, help set up a supply chain of pump-parts. Your job is NOT finished yet! People are willing to pay to have their pumps fixed, but you left them with no one to call and no materials to work with. Its embarrassing. Me with our awesome driver/roadtrip DJ Jallah!